As a flawed hero, one need look no further than Macbeth, a man who learned he would be King and then moved heaven and earth to make sure that the prophesy came true. Originally penned by William Shakespeare, it is receiving a new world premiere adaptation in the hands of Long Wharf Theatre’s Associate Director Eric Ting until Sunday, February 12. While purists may not approve, “Macbeth 1969” moves the conflict from the heaths of Scotland to the American mid-west and the Vietnam War. The Three Witches, who are also referred to as the Weird Sisters, are now nurses, Socorro Santiago, Shirine Babb and Jackie Chung, who care for Macbeth and his fellow soldier Banquo (Barret O’Brien). When they return from the conflict, having shown great courage and bravery in battle, they enter a veteran’s hospital at Christmas time. The words of prophesy by the nurses ignite an ambitious quality in Macbeth’s character and suddenly he desperately wants their words to be his destiny. No one who stands in Macbeth’s way is safe, not child or adult, and soon the landscape is littered with blood and bodies. Virtue is abandoned as the quest for greatness propels Macbeth, a masterful McKinley Belcher III, to sacrifice honor. The atmosphere is one of storm and thunder, “sound and fury signifying nothing,” where ghostly apparitions appear at will and “all is the fear and nothing is the love.” Macbeth, once the idealized hero, has been transformed by his greed for control into a fiend and a mad tyrant. Eric Ting also directs this disturbing interpretation of one of the Bard’s most tragic tales, making it contemporary with an emphasis on the struggle of soldiers returning home from battle. 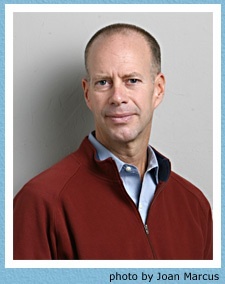 For tickets ($40-70), call Long Wharf Theatre, 222 Sargent Drive, New Haven at 203-787-4282 or online at www.longwharf.org. Performances are Tuesday at 7 p.m., Wednesday at 2 p.m. and 7 p.m., Thursday at 8 p.m., Friday at 8 p.m., Saturday at 3 p.m. and 8 p.m. and Sunday at 2 p.m. Witness for yourself how Macbeth’s crushing need for power spells his ultimate doom. Imagine running your life on a rigid timetable, where even the slightest deviation could potentially spell disaster. We all function accordingly to the clock, keeping track of school and work schedules, doctor’s appointments and other dates on a daily basis. Can you imagine what would happen if your watch stopped, your alarm clock failed and your IPad or Blackberry crashed? Horrors! Take a page from the precise scheduling that rules the life of Bernard, an American architect, living the good life in Paris. This ex-patriot’s existence is revealed with hilarious consequences in Marc Camoletti's farcical comedy “Boeing Boeing,” translated by Beverly Cross and Francis Evans, taking off on regular flights of funny business at Hartford Stage until Sunday, February 12. Bernard, an engaging (pun intended) and charming Vince Nappo, is so good at keeping women happy that he has almost made a profession of it. With great care and expertise, he has managed to become engaged to Gloria (Kelly D. Felthous), his American stewardess, Gabriella (Kathleen McElfresh), his Italian flight hostess and Gretchen (Claire Brownell), his German cutie. Each flies a different airline so he feels he is safe and secure. While Bernard has no intentions of marriage, he does enjoy the pleasures of having a trio of fiancées. His long suffering housekeeper Berte, adorably captured by Denny Dillon, is kept busy getting the apartment ready for the ever escalating series of arrivals and departures. Bernard is quite smug about his accomplishments in the romance department and when his old friend Robert ( Ryan Farley) arrives unexpectedly, Bernard can’t help but brag about how well it all works. Robert, while marveling on the arrangements, does express a little skepticism on how a little turbulence, like a change in flight plans, could complicate the delicate deal. Director Maxwell Williams makes sure the landings and takeoffs are smooth, but you should still keep your seat belt fastened tightly. 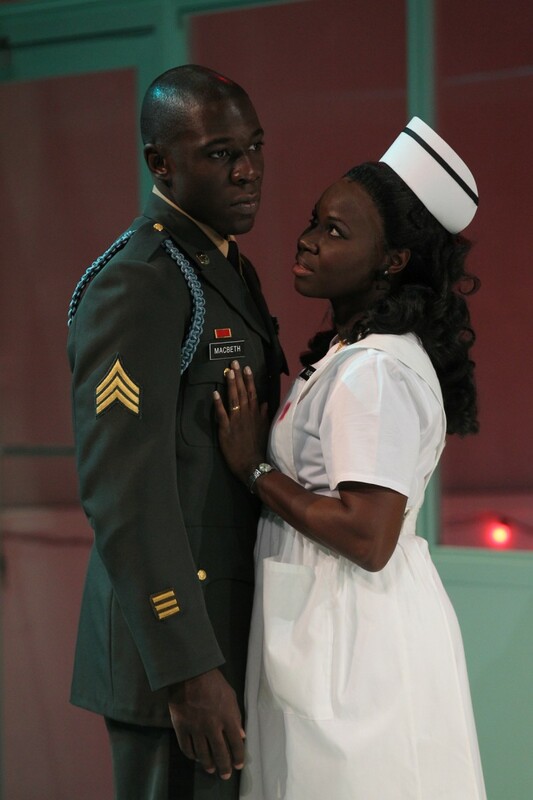 For tickets ($69.50-85.50), call the Hartford Stage, 50 Church Street, Hartford at 860-527-5151 or online at www.hartfordstage.org. Performances are Tuesday, Wednesday, Thursday and Sunday at 7:30 p.m. and Friday and Saturday at 8 p.m., with matinees Sundays and selected Wednesdays and Saturdays at 2 p.m. Prepare for a bumpy ride when Captain Bernard is in the cockpit trying to keep a trio of airlines flying high without a mid-air collusion. CINEMATIC TITANIC employs a cast from Mystery Science Theater 3000 and takes a terribly bad movie to new heights of enjoyment by “riffing” the actors, the action and everything in between. 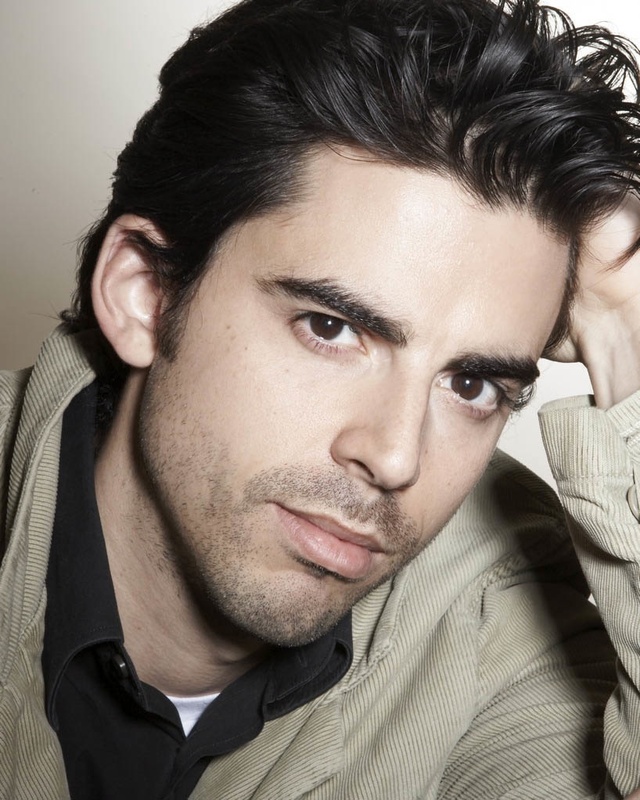 Billed as 600 laughs or riffs per movie, this satiric genius will play for two performances Thursday, February 2 at 7 p.m. and 9:30 p.m. at the Belding Theater, part of the Bushnell Center for the Performing Arts in Hartford. 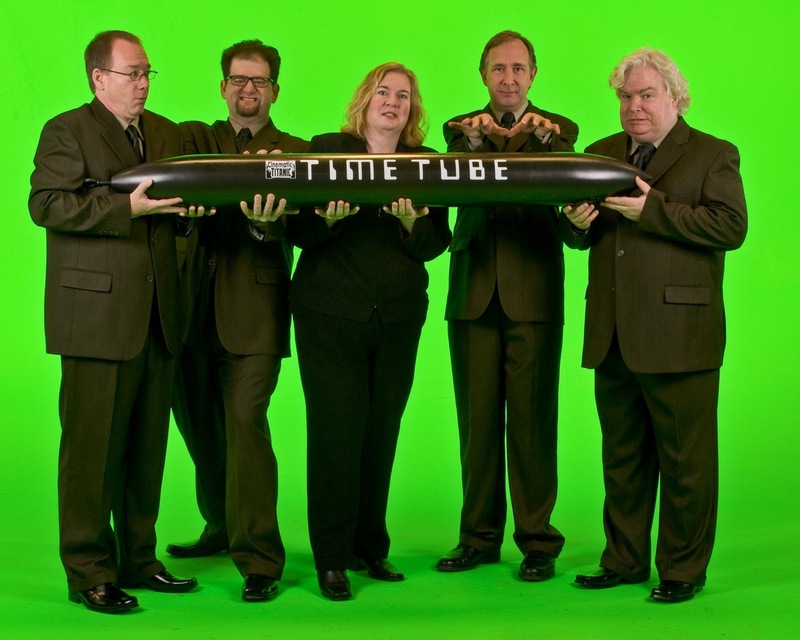 According to founder Joel Hodgson, “the commentary by the acting troupe is at the heart of the show.” It is an outgrowth of Mystery Science Theater 3000, created twenty years ago, that performed two hundred shows to great reviews. 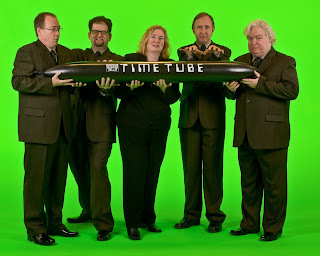 The hit programming won the Peabody Award, received Emmy nominations and was named one of the top TV shows ever by Time Magazine. The movies chosen, for practical reasons, depend on the licensing fees the group can afford or if the movie is available in the public domain. While the producers of the selected films may complain, the actors in them like the attention, aren’t offended and welcome the royalties. For tickets ($35), call the Bushnell, 166 Capitol Avenue, Hartford at 860-987-5900 or online at www.bushnell.org. Performances are Thursday, February 2 at 7 p.m. and 9:30 p.m. If you are into pop culture, this cult show may be just the unique theatrical experience for you. Tom Santopietro’s career is as colorful as a rainbow, with the appropriate pots of gold at both ends. He could have been a tennis pro or a lawyer and chose instead to take the yellow brick road directly to theater and films, his first loves. Leaving his hometown of Waterbury, Connecticut, after graduating from the University of Connecticut School of Law, he decided to try his hand working on Broadway shows as a stage and company manager. He handled the business side of show biz full-time for fifteen years when the creative urge to write struck him. Having been involved with more than thirty Broadway shows, from “Jersey Boys” and “Noises Off” to “The Iceman Cometh,” he was immersed in the stories and lives of stars. While working behind the scenes, “I needed to do something more creative. I didn’t tell one person, because if I didn’t finish the book I would have felt really awful. When it was done, I showed it to my closest friend of forty years who said, incredulously, ‘this is really good.’ I was in the right place at the right time. A friend in a publishing house, Thomas Dunne, offered to read it and, even though he wasn’t a Barbra Streisand fan, he bought the book.” Santopietro’s first book was “The Importance of Being Barbra” in 2006. After Barbra Streisand, Santopietro focused his attention on Doris Day in his book “Considering Doris Day.” Ms. Day is a recluse who is rarely seen in public. He was thrilled, therefore, when a year after the book was published, Doris Day called him. Speaking on the phone for an hour, she expressed how happy she was with the publication and the fact that he took her seriously as an artist. Santopietro claims she was “warm, funny, smart and I fell in love with her all over again. Her review is the only one I need.” He also created a musical show on Day with Billy Stritch singing her songs. The weekend of February 4 and 5, Santopietro and DeSare will present the world premiere of their latest venture: “That’s Life! Stories and Songs of Tony Bennett, Dean Martin and Frank Sinatra” at Waterbury’s Seven Angels Theatre, the same venue where his tribute to Frank debuted. When he saw the second installment of the movie that covers five decades and flashes back and forth from the early twentieth century when a young Vito comes to America and sees the Statue of Liberty for the first time to Vito’s son and Mafia chief Michael Corleone, he envisioned his own grandfather coming alone to America, at the age of 13, with only 20 lira in his pocket. Santopietro, who grew up half-Italian, lived in an Anglo world, a WASPy world, essentially in two different worlds and he reflects on that in this book. For tickets ($27.50), call Seven Angels Theatre, Plank Road, Hamilton Park Pavilion, Waterbury at 203-757-4676 or online at www.sevenangelstheatre.org. 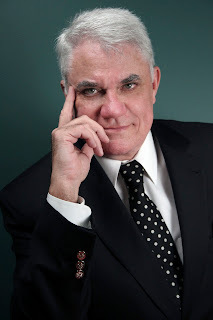 Performances are Saturday, February 4, at 8 p.m. and Sunday, February 5 at 2 p.m.
Let Tom Santopietro share his stories, his passion and his love for this trio of Hollywood legends as Tony DeSare makes their favorite music come alive. As a new artist, with two years yielding a paint brush, Gordon Skinner’s work is big and bold, bright with color, deep with meaning. 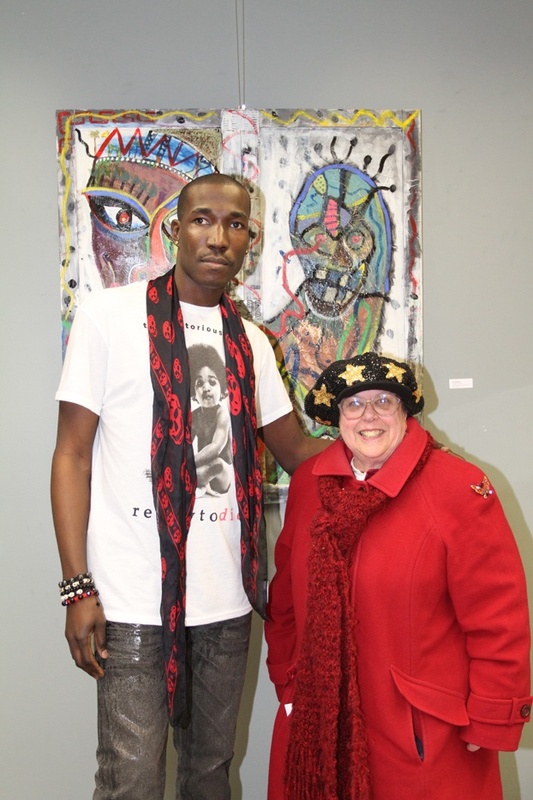 Strongly influenced by his African-American roots, his work is currently on exhibit at the New Haven Public Library until Saturday, February 18.
explores his personal search for identity, a subject he claims all artists battle with in one way or another. Skinner does art for the people, his way of developing his "own visual language." Alone, with his anger, he sees the world through honest but questioning eyes, seeking to document that he was here and what he saw. To Skinner, everything is an experiment, but he fully credits Picasso, Pollock, Lennon, Jean Dubuffet, Joan Mitchell and Tracey Emin, with influencing his art. Working in house acrylics, with collage and spray paint, on canvas and wooden panels, he tries to dispel stereotypes and explore cultural values, poverty, HIV AIDS, drug abuse and, most of all, his own voice. Through his work, he takes risks, using primitive and vigorous strokes, often painting masks that alternately reveal and hide the soul. His works, like Tin Drum, Zulu Warrior, Wise Noble and Crack Baby , allow Skinner’s passions and questions to be examined. 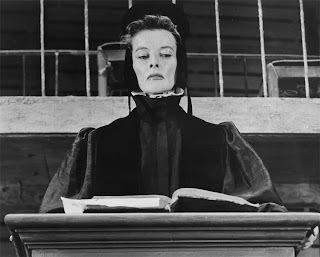 Katharine Hepburn as Portia in Merchant of Venice American Shakespeare Festival Theatre, Stratford. Until April 1, 2012, you are invited to the Fairfield Museum and History Center, 370 Beach Road, Fairfield to discover the rich theatrical history of the area. 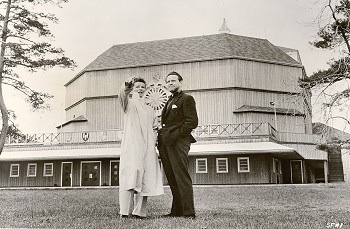 This unique exhibit features peeks before and behind the curtain, with special spotlights cast on the Westport Country Playhouse, Lucille Lortel and her White Barn Theatre and the American Shakespeare Theatre. Special highlights yet to come are Lunch and Learn: Kate’s Cottage with author and filmmaker Michael Bielawa on Katherine Hepburn’s stay in Stratford in a little waterfront cabin. Kate helped bring the works of Shakespeare to life. 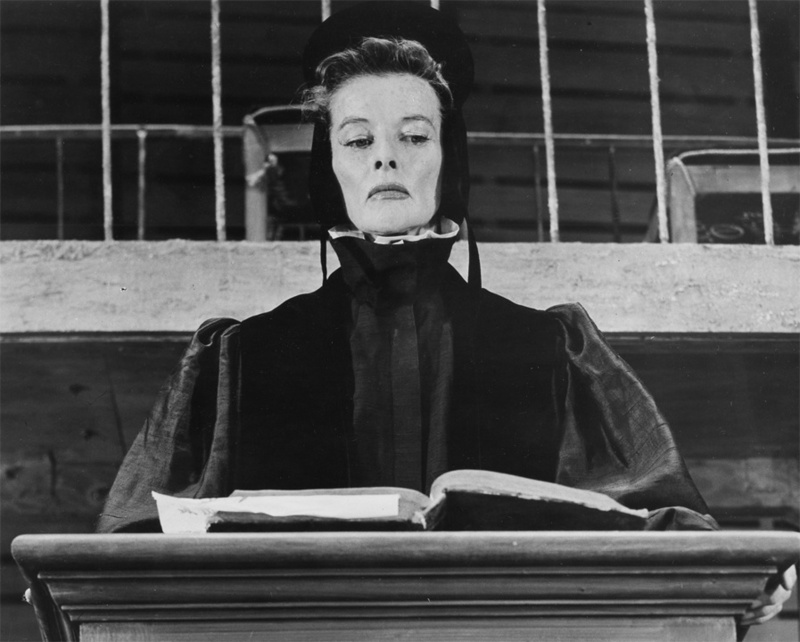 A short film “Along the Shores of Memory: The Katherine Hepburn Cottage” will also be shown. Cost is $8, members $5 on Thursday, February 16 at noon. Bring your own lunch. Lemonade and dessert will be served. On Thursday, March 8 at 7:30 p.m., the spotlight will focus on “The Queen of Off- Broadway,” Lucille Lortel, who was an actress, producer and a major player in the development of theater off-Broadway, including but not limited to the White Barn Theatre. A film screening and discussion will take place at the Westport Public Library, 20 Jessup Road, Westport. The event is free but pre-register by calling the library at 203-291-4840. The Fairfield Museum is open Monday-Friday 10 a.m. to 4 p.m. and weekends noon-4 p.m. Admission is $5 adults, $3 students and seniors, children under 5 free. Call for more information to 203-259-1598 or visit www.fairfieldhistory.org to see the complete schedule of events. The creative team of "The Great American Mousical"
Forget winter doldrums and wind chill factors. 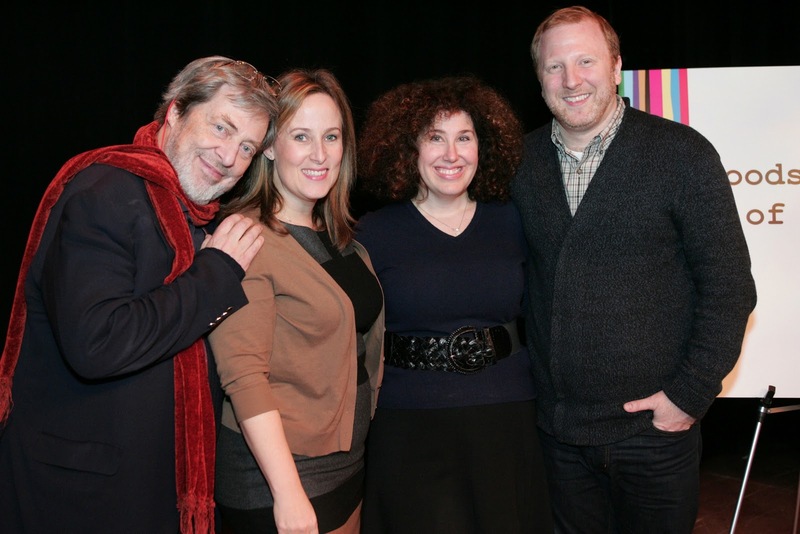 The weekend of January 13-15, the Goodspeed Festival of New Artists, was one hot rockin’ event. 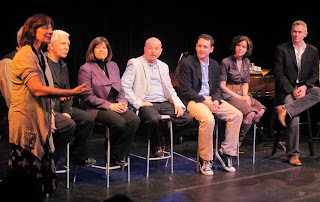 It featured three new musicals, “Harmony Kansas,” ”Not Wanted on the Voyage” and “The Dogs of Pripyat” as well as an introduction to a new musical “The Great American Mousical” coming to the Norma Terris Theatre in Chester in the fall. Add to all those good treats two cabaret evenings stuffed with new songs about penguins and Pinocchio and everything in between, a trio of great theater talks, a concert of Noel Coward music and a tour of Goodspeed’s theater building as well as its amazing 300,000 costume collection. The weekend ended with a Writers Reception at the Gelston House, next door, when the three writing teams shared their ideas and insights. Don’t be left out in the cold next year. The Festival dates are Friday-Sunday, January 18-20, 2013. Mark your calendars now! Musical theater is alive and well and thriving on the stage of the Goodspeed. Imagine your favorite science fiction comic book characters coming to life on a large screen, in color and with voices and sound effects. This seemingly far-fetched idea is a reality today…if by today we mean Saturday, January 21 at 8 p.m. at the Belding Theater in Hartford, part of the Bushnell Center for the Performing Arts. Turn back your imaginary time clocks to 1933 and experience “The Intergalactic Nemesis,” billed as a science fiction period piece, stuffed with romance, horror and suspense. Travel along with Pulitzer Prize winning journalist Molly Sloan, her intrepid sidekick assistant Timmy and a mysterious librarian Ben as they race to save the world. Sludge monsters from the planet Zygon are set to invade and this unlikely trio of heroes is all that is posed to stop them. Listen and feast your eyes as the giant screen is enhanced by three live actors, a Foley artist making the sound effects resonate and a keyboardist adding appropriately spooky music. Over 1000 hand-drawn comic book images will barrel and blast you to intergalactic nirvana, LIVE. For tickets ($28-38), call the Bushnell, 166 Capitol Avenue, Hartford at 860-987-5900 or online at www.bushnell.org. Chris Gibson gets to play hero and villain and a whole lot of the characters in between and it’s “great fun.” When he moved from Orlando, Florida to Austin, Texas, he had to reestablish his acting career credentials all over again. He began by volunteering to mow the lawn at a local theater company and thus won his first audition, definitely through the tool shed door. Gibson credits Jason Neulander, a producer and sometimes actor, with the idea for “The Intergalactic Nemesis,” and says it was fourteen years in the making. It began as a radio drama and has mushroomed into the version that will grace the Belding Theater this weekend. The drama will continue in trilogy form and the second sequel will debut in late spring or early summer. This “live graphic theater,” says Gibson, is unlike anything else, combining the three art forms of comic book art, radio drama and music.” It is all computerized, all memorized, with gorgeous art work. For example, when the characters jump on the train, a box of macaroni and cheese is utilized to mimic the wheels hitting the tracks. 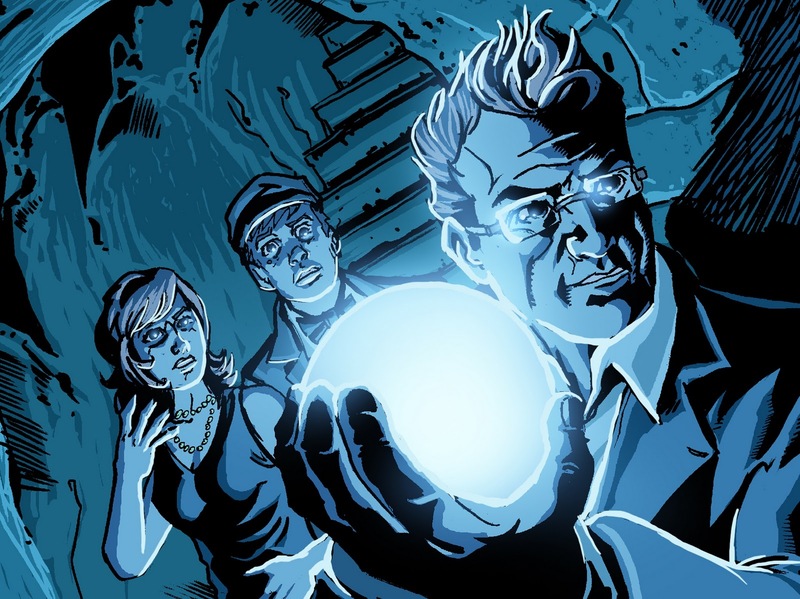 Inspired by “Star Wars” and “Raiders of the Lost Ark,” it appeals to comic book fans, science fiction lovers and followers of radio drama. As for Chris Gibson, “I’m having the time of my life.” Hopefully he doesn’t have to mow the lawn any more. Fairfield University’s exciting Open VISIONS Forum will welcome film critic Rex Reed down the red carpet on Sunday, January 29th at 3 p.m. to the Quick Center to address “Hollywood Notebook: Glory or Gory?” Former co-host of the syndicated television show “At the Movies,” Reed writes a current column “On the Town with Rex Reed” for The New York Observer. Occasionally an actor himself, Reed has performed in the movie version of Gore Vidal’s “Myra Breckinridge,” in the film “Inchon!” and in “Superman,” as himself. Back in the late 1970’s, he was a regular on the TV program “The Gong Show.” He also guest voiced himself on the animated series “The Critic” as well as served on the jury of the 1971 Berlin Film Festival. In the 2009 documentary “For the Love of Movies: The Story of American Film Criticism,” he explained the role of movie critics over the past century emphasizing how important film critics were in the 1970’s. No stranger to controversy, Reed created a firestorm with the rumor that in 1992 at the Academy Awards Jack Palance announced the wrong name as Best Supporting Actress, Marisa Tomei. Reed contended Palance was too confused or drunk to read the correct name. The Academy denied any cover up or mistake. For tickets ($45), call the Quick Center on the campus of Fairfield University at 203-254-4010 or 1-877-ARTS-396 or online at www.quickcenter.com. Let Rex Reed provide the inside scoop on the Hollywood movie scene as he sees it from his unique perch at the top. Sister Robert Ann never was a shy wallflower kind of nun. She always craved the spotlight. Now she has it smack dab in her face. If you’re a long time fan of Dan Goggin’s Nuns and Nun-sense, you’ll be psyched to discover that Sister Robert Ann will occupy the spotlight the way she always wanted: solo, alone, by herself, individually, without accompaniment. 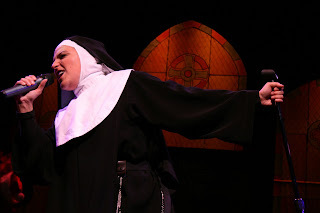 “Sister Robert Ann’s Cabaret Class, a One Nun-sense Musical Event” will grace Waterbury’s Seven Angels Theatre the weekends of January 21 and 29. Christine Mild stars as the spunky and feisty Sister who is as skilled with a wrench and pliers working on a car’s carburetor as she is with tuning her own vocal pipes. The good Sister Robert Ann has starred in other Dan Goggin musicals and belted out seventeen signature songs, giving her enough musical material for an evening all her own. Since Christine Mild is a gold star member of the Little Sisters of Hoboken, having originated Sister Robert Ann and her Brooklyn street-wise ways in south Florida, she is a natural to take on this one- woman feast. She will deliver such memorable numbers as “What Would Elvis Do,” “Growing Up in Brooklyn,” “Twelve Days Prior to Christmas” and her theme song finally come true “I Just Want to be a Star.” In addition, she will engage the audience in a lesson on cabaret acts just in case you want to take your own show on the road. For tickets ($30), call Seven Angels Theatre, Plank Road, Hamilton Park Pavilion, Waterbury at 203-757-4676 or online at www.SevenAngelsTheatre.org. There is plenty of free parking on site. Take a stroll down memory lane with Sister Robert Ann as she sentimentally renews her vows musically and spiritually for your listening pleasure. If the proof is in the pudding, then “Play With Your Food” has created the perfect recipe for luncheon delights over the past decade. Combining a good flavorful repast with a trio of savory theatrical treats, “Play With Your Food” is high on the menu of Fairfield County’s most popular noontime activities. The fun begins at twelve noon with a buffet lunch from one of the area’s epicurean treasures like Westport’s Blue Lemon, Da Pietro’s, Matsu Sushi and Garelick and Herbs or Fairfield’s The Dressing Room, Layla’s, Tuckers and The Pantry or Greenwich’s Nicholas Roberts, Le Pain Quotidien or Garelick and Herbs. Paired with this will be two lighter comic sketches, “Airbourne” by Gib Johnson about an airline employee who feels obligated to become involved with the travel plans and lives of passengers, with delightfully complicated results and John Bishop’s “Arizona Anniversaries,” a comic look at risk and reward and potential and possibilities. The afternoon concludes by 1:30 p.m. with a lively talk back with cast members and the audience. For reservations ($43), call 203-293-8831 or online at www.jibproductions.org. January performances will be held on the 10, 11,and 12, Tuesday – Thursday, at Toquet Hall, 62 Post Road East, Westport, on Tuesday, the 17th at Fairfield Theatre Company, 70 Sanford Street, Fairfield and on Wednesday, January 18th at Greenwich Arts Council, 299 Greenwich Avenue, Greenwich. Future performances in February, March and April will incorporate love letters and music from “1776,” light hearted comedies and excerpts from George Bernard Shaw’s “Pygmalion.” Check the web site for specific dates and selections. A Tenth Anniversary Gala will be held on Saturday, January 28 with cocktails, wine and hors d’oeuvres from Blue Lemon, Garelick and Herbs, Matsu Sushi and Tito’s Homemade Vodka at 6:30 p.m., followed at 8 p.m. with “Two For the Road,” theatrical offerings from “Sign of Life,” “ Pillow,” “ My Fair Lady,” “Camelot,” “Mack and Mabel” and more surprises. All the fun and fine food will take place at Dragone Classic Motorcars, 176 Post Road West, Westport. For tickets ($100), call 203-293-8831. Start off 2012 right. Sign up to “Play With Your Food” for fanciful entertainment and culinary delights. Tune your radio dial to a Memphis, Tennessee station circa 1950 and get caught up in the sensational sounds emanating from that small rectangular brown plastic box. The Disc Jockey of the hour is a young, naïve and white Huey Calhoun who sets out to bring a new style of music to the airwaves and unintentionally unleashes a tornado of novel sound. This Tony Award-winning 2010 Best Musical – “Memphis”- is bringing its exuberant excitement to the Bushnell Center for the Performing Arts in Hartford from Tuesday, January 10 to Sunday, January 15. With music and book by David Bryan (Bon Jovi) and Joe DiPietro (I Love You, You’re Perfect, Now Change) and choreography by Sergio Trujillo (Jersey Boys), we turn in to Huey’s plot to bring the underground music he’s heard in clubs, the lowdown jive of rhythm and blues and rock and roll, up into the light of day. Defying his ultra-conservative radio station owners, this adventurous high school dropout risks it all to play music that has been termed “racial” and inadvertently starts a sensation on the air. Discovering a new black singer Felicia, he also finds love for the first time, in a relationship forbidden by society, that he must keep hidden. Tunes like “Memphis Lives,” “Say a Prayer” and “The Music of My Soul” focus on the passion this new sound engenders in Huey and underscore the tensions and conflicts of integration at that time and that place. Hold on to your bobby sox as this musical and dance feast for the eyes, ears and feet rocks and rolls itself into your heart. For tickets ($17-72), call the Bushnell, 166 Capitol Avenue, Hartford at 860-987-5900 or online at www.bushnell.org. Performances are Tuesday, Wednesday and Thursday at 7:30 p.m., Friday and Saturday at 8 p.m., with matinees Saturday at 2 p.m. and Sunday at 1 p.m. and 6:30 p.m.
Get into the groove with this “West Side Story” tale of forbidden love that tells the true tale of a DJ whose passion for a bogey beat sets a town to sizzle. "MAMMA MIA!" WHAT A SHOW! 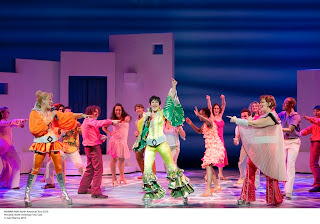 You don’t need to understand Swedish or even know where Sweden is on a map to fall in love with the ABBA inspired rock musical “Mamma Mia!” Even if your knowledge of the music group ABBA is non-existent, the show will surely win your heart and your joy even before the overture is complete. 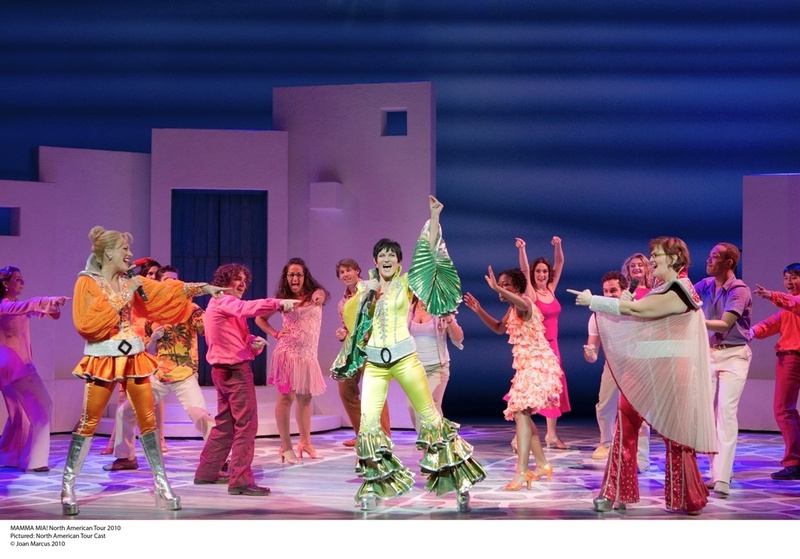 Dance down the aisle to the Palace Theater in Waterbury from Friday, January 20 to Sunday, January 22 to catch this lively with a capital L smash hit musical “Mamma Mia!” with music and lyrics by ABBA musicians Benny Andersson and Bjorn Ulvaeus and book by Catherine Johnson. Set on a mythical Greek island, the show is about a daughter Sophie, who at 20 is about to marry. Her greatest wish is to have her father walk her down the aisle, but there’s one small problem. Her mother Donna, a determined and vivacious independent spirit, who runs the island taverna, has never spoken Sophie’s father’s name. So the industrious and clever Sophie sends wedding invitations to the three candidates for fatherhood as determined by invading the privacy of her mom’s diary of twenty one years previously: an architect Sam, an Australian travel writer Bill and a proper British banker Harry . All three men accept the invitation they believe is from Donna and show up conveniently on the eve of Sophie’s nuptials to Sky . Fortunately the unsuspecting Donna has the moral grounding of Tanya and Rosie, the members of her old singing group Donna and the Dynamos, who literally and figuratively support her when the sparks of mistrust and accusations start to fly. The great ABBA songs like “Dancing Queen,” “The Name of the Game,” “S.O.S.,” “Thank You for the Music,” “I Do, I Do, I Do, I Do I Do,” and “The Winner Takes It All” and more than a dozen more, make this show sparkle with neon lights that spell Amazing, Bouncy, Beautiful, and Alive, in snappy and pulsating style. For tickets ($ 50-70), call the Palace, 100 East Main Street, Waterbury at 203-346-2000 or online at www.palacetheaterct.org. Performances are Friday and Saturday at 8 p.m., Saturday at 2 p.m.and Sunday at 1 p.m. and 6:30 p.m. The Palace is encouraging women’s groups of all sizes to choose “Mamma Mia!” as their next “Girls Night Out” destination by offering groups of 15 or more a 10-15 % discount on tickets to the show. Bridal parties, co-workers, social club leaders, and soccer moms looking to book their next group outing can contact Box Office and Special Services Coordinator, Deirdre Patterson at 203-345-2011, to plan their excursion and save on tickets. Special events include a pre-show brunch at 11 a.m. on Sunday ($75) prepared by Emily’s Catering Group and a Gla’Mar’Ours Girls Night Out on Sunday at 5:30 p.m. with music, appetizers and a cash bar that is free with a ticket to the 6:30 p.m. show.